These are the names that my grandmother gave each of our toes. Starting on the big toe, she’d work her way down, wiggling each one and purposefully saying their names until she got to the last one, Lily Pea. Then it was a grand tickle fest. It was a childhood delight. My Tom Bumbles are also a delight. 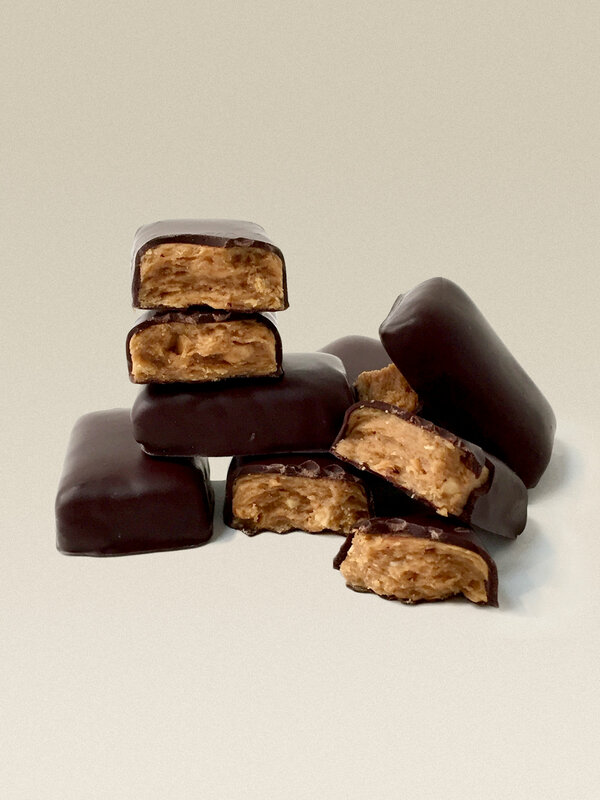 In our Portland candy kitchen, we carefully fold a few simple ingredients together to produce a truly remarkable candy bar. Organic peanut butter, organic sugar, Oregon sea salt and vanilla come together as a flaky and delicious treat. Then we cover the Tom Bumbles with organic chocolate. We have two styles of bar to satisfy just about everyone. I know my grandmother would be so happy that her little game turned into something so good and so fun.